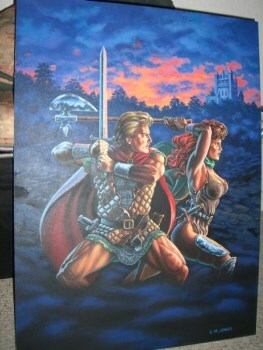 The original Darklands cover painting is a unique treasure, but it sure ain't cheap. Darklands was a great fantasy RPG from the early 90s that you probably never played, but that's okay because that's not actually what we're here to talk about. We're here to talk about the cover art, which, if not exactly iconic, is at least immediately recognizable to a certain subset of aged gamers. And I don't mean just the front of the box, either; I'm talking about the cover art. The original painting that served as the cover art (or at least what purports to be the original - buyer beware and all that) is now up for sale on eBay. The owner, Daniel Perkin, says he's "refocusing" his fantasy art collection and is thus looking to unload the famous (to some of us) Darklands painting by Larry M. Jones. "Darklands regularly makes it into lists of the best PC games of all time, and I think it is fair to say that the heroine in this painting helped sell more than a few copies of this game!" Perkin wrote on the eBay listing. She certainly is well-armed, but even so, I wouldn't say this is really a great piece of cover art. Despite the action poses there's no flow to it, and that bow-legged battle stance is beyond unnatural. I've never particularly cared for the cover, to be blunt about it, even when the game was new - although that's not to say I wouldn't have this thing hanging on my wall in a heartbeat if the opportunity presented itself. Alas, it's not likely to. Perkin is asking $1750 for the painting plus shipping, and my wallet just can't take that kind of hit for some interior decor, no matter how cool it may be. The good news is, that leaves the door open for one of you guys! The original Darklands painting will be on sale until May 7. Source: eBay, thanks to dan for the tip.